Americans love their pets. We feed them better than most humans in third world countries are fed. We dote on them with toys at Christmas, and we award them the honorary status of “children.” But do we acknowledge that all creatures are, like us, spirit soul? Do we honor them as living entities working their way slowly toward perfection, or do we just cater to their bodies—treating them like they are toys for our amusement? The spiritual literatures studied by Bhakti yogis teach that every living entity is, at it’s fundamental core, a spirit soul (called the atma). Every living being is a soul—individual and equal—wearing an individual body. In other words, the soul that is presently in your puppy, Fredo, is an individual living entity spending that lifetime inside the body of a dog. But look deep in Fredo’s eyes and you might sense the atma looking back at you. Try this. Think of bodies as light bulbs. Some are 15 watt, some 30 watt, some 1000 watt. The electric current that runs through the walls, into the lamp and to the bulb is the same. What is different is each bulbs capacity to express the current. A 15 watt bulb can only funnel just so much current into usable light. A 1000 watt bulb can channel so much more. So, in the same way, different bodies are capable of expressing different amounts of consciousness. 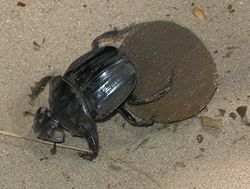 A dung beetle is concerned only with rolling or burrowing deeper into the cow patty. A dog body can express happiness, anger and love. A human birth allows the greatest expression of consciousness. But even within the human birth, there are gradations of consciousness. You might say, “Fredo’s gone!” Never the less, the body looks the same (just like Fredo is sleeping). What’s gone? The answer is: the atma (soul). And as a result, there is no more consciousness illuminating the body (like the electricity in the bulb). The atma has left Fredo’s body and is on it’s way to a new body. When you watch this Youtube video about Tara and Bella, remember that at one time in this country (not so very long ago), women and African Americans were considered property with no rights, and often treated inhumanely. Today, animals and other conscious beings, because they are not humans, suffer horrific cruelties (even with pets we often decide what’s “good” for them based on what’s convenient for us). We thoughtlessly squash a spider or ant. Some hunt animals to kill for “sport.” Yet Tara and Bella show us that we should reconsider our “dominion” over other species. Does dominion over atmas who are perhaps akin to a lower wattage bulb (in the example above) mean we have the right to kill them at will? Or does dominion mean to care for and protect all living beings? We should develop equal vision. Seeing all living beings as spirit soul, fundamentally and qualitatively equal, though presently expressing their consciousness through a vast variety of bodies, large and small, with simple or complex consciousness. 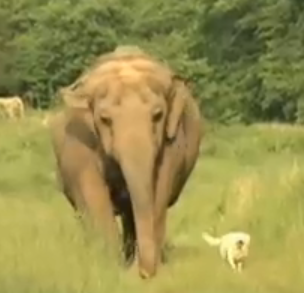 Tara and Bella understand that their vastly different bodies should not be an impediment to friendship. Perhaps we could learn something from them. you have a great site, Mayapriya d. thanks! Sending you good wishes.